At yesterday's press preview event in New York Nintendo announced the UK Wii U launch date of 30th November 2012, however they were sketchy on pricing saying only "that prices would vary throughout Europe". Today we have a clearer picture with many retailers adding the Wii U to their websites and now taking pre-orders for delivery on the official launch date. 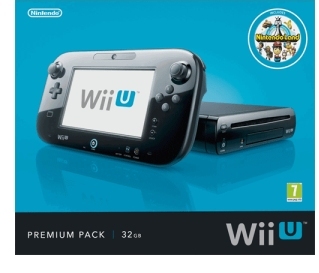 For the Wii U 8GB Basic Pack prices currently range from £247.85 to £269.99 and for the Wii U 32GB Premium Pack they range from £296.86 to £319.99. From our previous experience these prices are likely to fluctuate between now and launch with prices likely to drop as opposed to rising with retailers competing with each other for orders. However you will not loose out if you order now at a higher price as some retailers, like Amazon, have a price guarantee and will only charge you the lower price when the console is dispatched in late November. With the three launch dates in the US (18th Nov), UK (30th Nov) and Japan (8th Dec) all within 3 weeks of each other and the close proximity to Christmas, it's likely there could be stock shortages and therefore pre-ordering now would be advisable to avoid disappointment should this be a Christmas present.